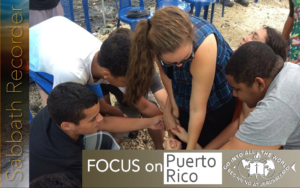 I had the privilege, along with four other youth from the Berlin and First Hopkins Seventh Day Baptist Churchs’, to go to Puerto Rico this past summer. Our time there was an amazing and eye opening experience. The relationships and connections we made there will be a blessing for a life time. I had never before walked into a place and been able to tell immediately that God was working there, but that was apparent the first time I stepped foot in Iglesia Bautista Del Séptimo Día. One of the purposes of the trip was to paint the church. We started the first day we were there and finished the front of the building before we left. While we were painting a couple people came over and spoke with us. One of these people was Eric, a teenage boy who came to the church off and on. To our surprise, English was his first language. We had a great conversation with him and he agreed to come to camp, which later became obvious it had been orchestrated by God. On our second day in Puerto Rico we had the opportunity to do street ministry outside a market in San Sebastian. I had never done street ministry and it was nerve-racking at first, but it quickly became easier. The people were incredibly receptive and the pamphlets we handed out (on the differences between Seventh Day Baptists and Seventh Day Adventists) inspired great conversations. The highlight of the trip, however, was by far the camp. The camp gave us a chance to get to know the kids of the church better and the faith of all those involved grew during that time. The theme of camp was breaking the chains. Through the preaching, teaching, worship, and fellowship we saw God work mightily. I wish I could share every little detail, but length forces me to focus on highlights. I mentioned earlier a young man named Eric. After just a week at camp he was like a different person. We watched him get set on fire for God and develop a passion for sharing His word with others. He told us by the end of the week that he felt God was calling him to be a missionary and that’s what he wanted to do now. He ended the week by being baptized. His transformation only took a week, but it was evident to everyone. Even people from our group were very touched by the camp. One night a preacher from another church came to give a message. Through the Holy Spirit he could tell us intimate details about our lives we had not previously shared and was able to pray for us exactly how we needed it. There was a lot of tears, prayer and healing that night. The theme of breaking the chains held true for us in that instance and that night is the closest many of us had felt to God in a long time. Also during camp, we went door to door and handed out information on the church along with cans of tomato sauce, which is a staple there. It was a very unique experience. My group went and delivered tomato sauce to one man who smiled and thanked us. This may not seem significant but Ruth, a long term missionary in Puerto Rico, later told us that she had never seen the man smile before. God can even work in tomato sauce and that’s what I saw him do that day. My fondest memory from the whole trip also happened during camp. One night we were singing worship songs in Spanish as we always did and the Spirit was really moving. We were all getting really into it and one of the boys, Juma, turned to me confused. He asked me what I was doing, saying I didn’t even understand what I was saying. Technically, that was true. I had only a vague understanding of what I was singing, but it didn’t matter. I could’ve been worshipping in any language. It was not the words that made it special, it was the presence of the Spirit and the state of my heart. It may not have been in my language, but it is still one of the best worship experiences I have had. While in Puerto Rico we also had the opportunity to go and pray for two people who were sick. One was an elderly woman who had lost her ability to walk. She welcomed us into her home and we were able to sing for her and just be light in her life. We prayed over her and she told us she believed she would one day walk to church. Her faith has stuck with me and is a great example to us all. The other sick person was a man who had a cancerous tumor. The doctors were not sure what they could do for him. We laid hands on him the night before we left. Since returning home, we have found out he went to the doctor a week or so later and the tumor had shrunk so much the doctors felt they didn’t need to take any action. God is good! One of the final days that we were in Puerto Rico we had a cantata and sang for the church. The cantata was for anyone in the community. A new family came that had never been to Iglesia Bautista Del Séptimo día. Since we left, they have continued to attend church there which is wonderful. Since returning, many details have faded from my mind. I can’t remember what exactly we did on every day or what exactly people said. However, what we learned and the relationships have stayed. Every day at 3 my alarm on my phone goes off and I pray for a couple of the people I met there. I know that many of the other youth who went still talk to the kids we met there. Language and distance are nothing when the love and unity of Christ is working in us. Overall, this trip was a fantastic experience and we saw, and continue to see, God’s goodness more clearly because of it.